Own your very own Enterprise! 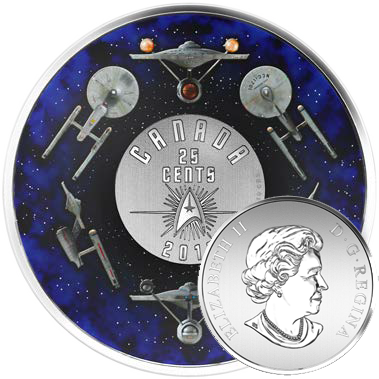 This special set includes a Star Trek-themed coin and three collectible stamps, all in one unforgettable package. Own your very own Enterprise! This special set includes a Star Trek-themed coin and three collectible stamps, all in one unforgettable package for £32.95 each! (Plus £2.95 P&P). The reverse design combines detailed engraving with vibrant colour application for a colourful ode to the legacy of the U.S.S. Enterprise (NCC-1701). Outer space serves as the dark background in the wide outer ring, while a rich blue colour recreates the gaseous appearance of a nebula cloud. Positioned in a circle, six different views of the Enterprise allow the viewer to examine the vessel's features from every angle: overhead, underside, bow, aft, starboard and portside. In the engraved only centre is the distinctive arrowhead-shaped Starfleet insignia. The stamp on the cover features a classic head-and-shoulder photo of the legendary commander of the U.S.S. Enterprise, Captain James T. Kirk (played by Canadian actor William Shatner). Dressed in the gold uniform of Starfleet’s command division, Kirk is positioned against a stunning space themed background in which his beloved ship is depicted in orbit above a red-coloured planet. Inside the custom packaging, two coil stamps bring together classic nemeses from the television series. On the left is an overhead view of what is arguably the most iconic spaceship of our time: the U.S.S. Enterprise. Cruising through the stars on her five-year mission of exploration and discovery, the ship is positioned in a way that provides a glimpse of her twin warp nacelles and distinctive saucer-shaped hull, which bears the registration number NCC-1701. Her counterpart in the Klingon Imperial Fleet, a D7-class battle cruiser, is depicted on the second stamp, as it appeared in the episode Day of the Dove. The ship’s iconic long neck and bulbous command pod jut out from the spread-wing hull in a way that gives it an ominous and aggressive appearance.